Jay and I went up to Karrakatta Cemetery in Perth today to see if we could find the grave of her best friend who died 13 years ago. Thanks to all the death and burial records being online now, all this information is (finally) easily accessible and we found her details pretty quickly. It was an emotional moment for Jay, who didn’t even know when she died, let alone where she was buried (its a long story and not mine to tell). Personally, I think it’s good to have a date and place to focus on, its been a long time not knowing anything. 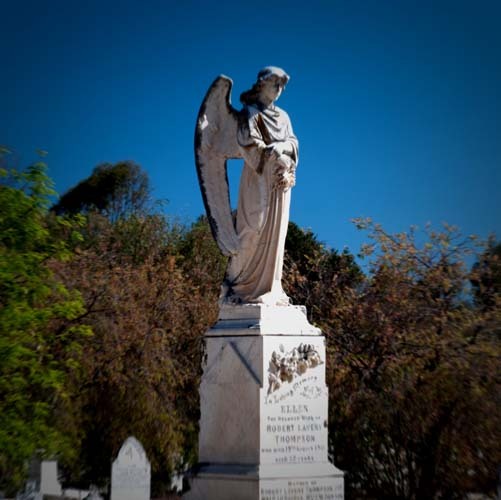 Karrakatta Cemetery is the biggest in Perth – its huge actually, and home to many different denominations from Anglican, Catholic, Greek Orthodox, Jewish, Presbyterian and others. Some of the graves date back to the early 1900s, so its not old, but the variety is amazing. Personally, I loved the older graves, which were on sandy ground for some reason (the newer ones were on grass and better looked after) – there were large angels and old graves surrounded by ironwork. I love the messages of love on the graves, some people obviously loved each other so very much, its very reassuring. I did take some photos, but they were crap, so had to photoshop them! ← When I were young.. I think it’s going to take a while for all the new information to settle. I feel very wobbly today, but going up there was a good idea. Love taking pictures of graves though, strangely therapeutic. 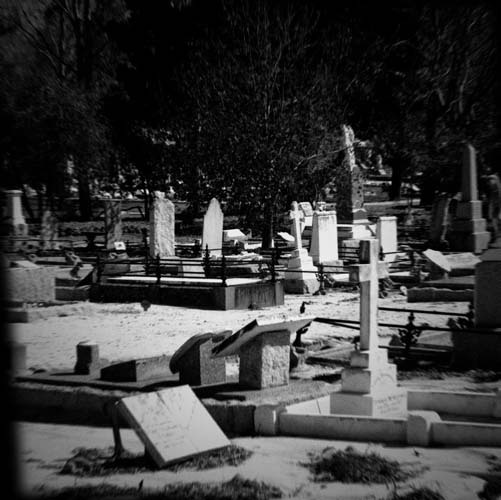 I find I have an affinity with cemeteries. Thats ok, treasure, today was a big deal, you can’t expect for everything to sink in overnight. Just knowing when and where has got to help put things in place. It was fun, I think I’m turning into a history fan, I’d love to investigate some of the older families and stories! Same here. And all those fabulous names to weave into a story!